Unfortunately, death is inevitable. No one is safe and when death knocks on our door. It may come in the form of an infectious disease caused by viruses or natural disasters such as hurricanes or earthquakes. In order to somehow prevent and prolong death’s forthcoming, we need to prepare ourselves for the worst and use our given ability to foresee any unpropitious events in the future and be watchful enough to take proper preventive measures for coming and known risks, because in the first place, it is easier to get things right than repairing the causality. Can you imagine driving on a highway without any traffic signage or signal lights, or visiting the hospital or chemical factories without any caution signs – it would be chaotic, right? Warning signals or safety signs are a big part of our daily lives. They can be found everywhere, from different establishments such as hospitals, schools, offices, construction sites or roads. Warning signals can be essential to any facility and person for the safety and security measures. These signals or signs must be able to catch our senses from the sound, visual and feel, more importantly, they should be informative, clear and recognisable, in order for us to perceive the message they want to elucidate. Warning signals have played a significant role in safety and security, and in minimising disasters for decades. They warn us of unexpected incidents. Obviously, warning signals warn us of presumed danger. These informative signals/signs must convey a clear message and provide relevant information to keep people from an unexpected accident, potential danger or disaster. In the modern day, security cameras and security alarms are rapidly becoming a standard measure for security to have in houses, this helps the property owners to prevent malicious incidents like vandals, robbery, and theft. They also have a vast range of potential industrial applications from Loading Bays to Aircraft Obstruction. Warning Signals do save lives. Warning signals and safety signs do really save lives. Having these signals on a property can secure the safety not only the facility and the products/services but also the people occupying it. Whether it be to attract attention, or to advise of an obstruction, warning signals serve a huge purpose when it comes to safety. Watchfires – which act as a signal and usually lit in the night. Flare/Flash – a burst of light used for communication and signalling. Flags – usually displaying a rectangular piece of fabric. Blinkers – usually found in vehicles and used as an indicator for direction. Posts – a pole or stake used to mark something. Alarms – Alarm systems may vary from different types of uses. 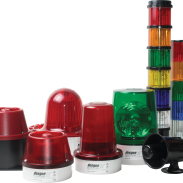 An example of these is Sounders, which signal something with the use of a tone, commonly used in industrial / noisy areas such as factories to alert individuals that attention is required. Horns – Horns are commonly used in vehicles such as cars or trucks. This device allows the operator/driver to warn any unsuspected motorists or pedestrians to signal any unwanted occurrences like accidents. Buzzers – also known as beepers, also a type of audible signalling device which is triggered from the mechanical or electromechanical device and outputs an alarm or a timer. Sirens – Sirens produce a wailing or very loud sound and commonly used as an alarm or warning for an incoming storm/tsunami or any natural phenomenon in the location. An old saying goes “prevention is always better than cure”, we can’t prevent disaster from happening but we have given ourselves the power to act and prepare before it starts. That’s when Warning Signals play a big part of our lives, preventing us from unwanted occurrences and possibly saving our lives.